It’s that time of year again…burgers on the grill, beers on ice and fireworks in the back of the truck. But don’t forget about your furry little friends during the festivities! More pets go missing around the 4th of July than any other time of year and noisy fireworks are to blame. Pets hear the KABOOMS and freak out and take off running, but they can’t escape the booms because they are everywhere! 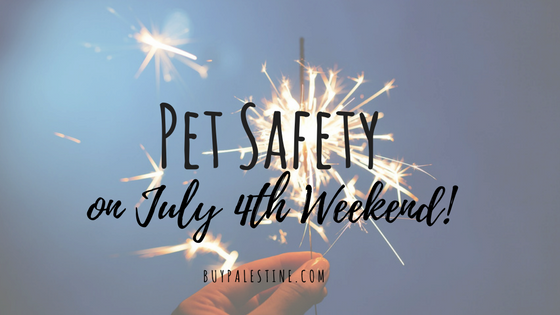 According to national statistics, animal control officials across the country see a 30-60% increase in lost pets each year between July 4th and 6th. In fact, July 5th is one of the busiest days of the year for shelters. Sadly statistics show that only 14% of lost pets are returned to their owners; and worse, 30-60% of lost pets are euthanized because they cannot be properly identified and returned to their owners. 1) Stay inside: Try to keep your pet indoors at all times during holiday celebrations. Ideally, someone stays home with your pet, but if not, be sure they can’t freak out and get loose! Also keep your dog leashed when going out for walks. 2) Make them feel safe: Comfort your pets with petting, hugging, talking to them in a soothing voice, providing a treat and staying nearby if possible. Make sure they can access their crate, favorite nap spot or “safe place.” Try to keep the routine as normal as possible. 3) Avoid the noise. Try to drown out the fireworks sounds as much as possible by closing windows, playing music or turning on the TV, especially if you’ll be gone to view the fireworks displays. 4) Act normal! Your pet takes cues from your and your family’s actions. It will help if you go about your normal routine as much as possible, talking and playing with your pet as usual. Have a fantastic and family-filled 4th!! ‘MERICA!